These processes are similar to what happens when a sheet of paper is cut by a pair of scissors. In this case, instead of paper, we have a sheet of metal. Apart from paper being much easier to cut, it is also much more flexible. If the paper is bent during its being cut it does not matter. If a sheet of metal is bent then this can spoil it. If we consider a sheet of metal that is to be cut into two parts it is supported on one cutting edge whilst a second is brought down on it. Of course the spacing between the two edges is zero, ie they have to touch at every point where one edge passes the other. If this is not the case both of the resulting edges will be spoilt. Furthermore once one blade is forced apart from the other there will be tremendous forces pushing both blades even further apart. If the top blade is parallel to the bottom one the force required to push it through the material will be very large. The solution to this is to have the top blade at a slight angle to the bottom one. This is, of course, most familiar in the guillotine as used in separating a human head from a human body. If the top blade is at an angle, then when cuttting metal plate, the part of the plate that has been cut will be at an angle to the part of the plate that has not been cut. 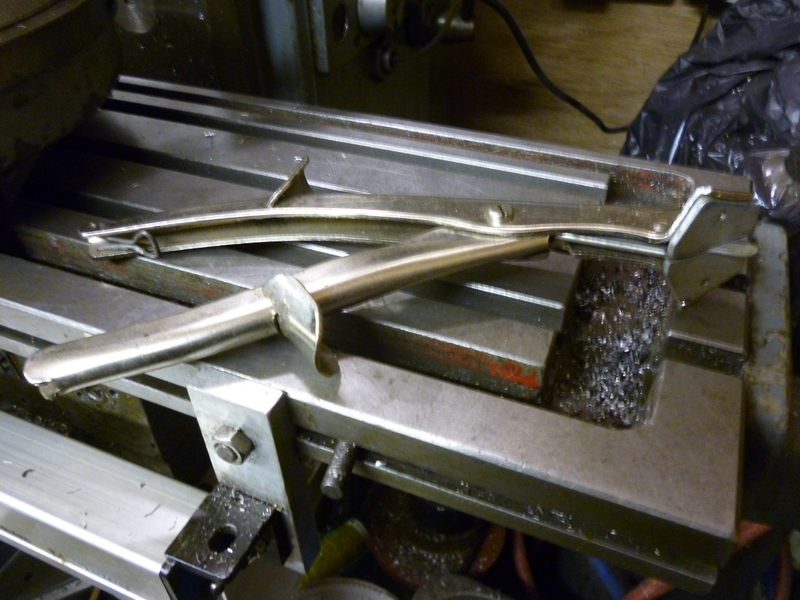 This will be offset by the natural spring in the metal to try and get back to where it was. For this to happen the angle of the top blade has to be very small. Clearly there is a relationship between the thickness of the workpiece, the width of the workpiece and how small the angle can be. All this means that it is possible to cut large sheets into smaller flat sheets if they are not too wide and the guillotine is powerful enough. With shears this is not the case. If the width of the workpiece is shorter than width of the blade then it is possible for both the resulting pieces to be flat. In practice one blade is often curved to as to even out the power required over the whole cut. But, with shears, the cutting edge is often shorter than the length needed for the cut. This means the cut must be made on many little cuts. But as each cut is made both sides of the workpiece will run into the joint on the shears. 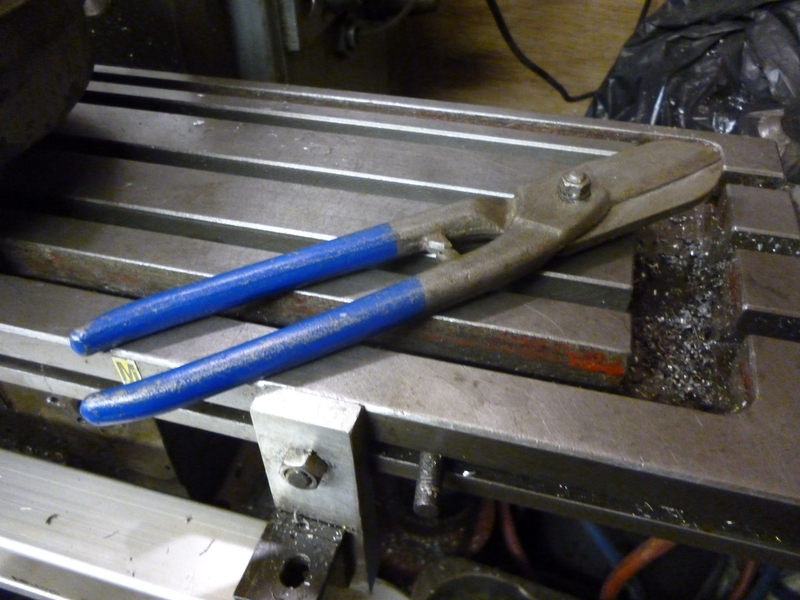 The second problem with these shears is that there is not enough force to cut the metal. This can be solved by using a more complex system of levers. Shears like this are known as “compound” shears. With the shears shown above the two halves are nearly symmetrical. It is easy to see that if a piece of sheet passes along the cutting edge shown it will be bent up by the part near the joint. At the same time the same will be happening to the other part of the workpiece. This is almost fundamental in shearing that in most cases one or both parts will get bent. It will be seen that it is possible to make shears where all the bending occurs on just one side of the shears. However, if the material is thin enough these shears will cut just like scissors – the material will be “bent” but because it is so thin this will not matter. fig shears where one side will be flat. The jaw that is uppermost is straight and a straight line can be drawn along this edge and it can be seen that there is no obstruction to it. The part of the sheet on this side will be completely flat. This is achieved at the cost of the other side being completely sacrificed. This means that these shears are not suitable for separating one large sheet into two significant sized parts with both of them staying flat. 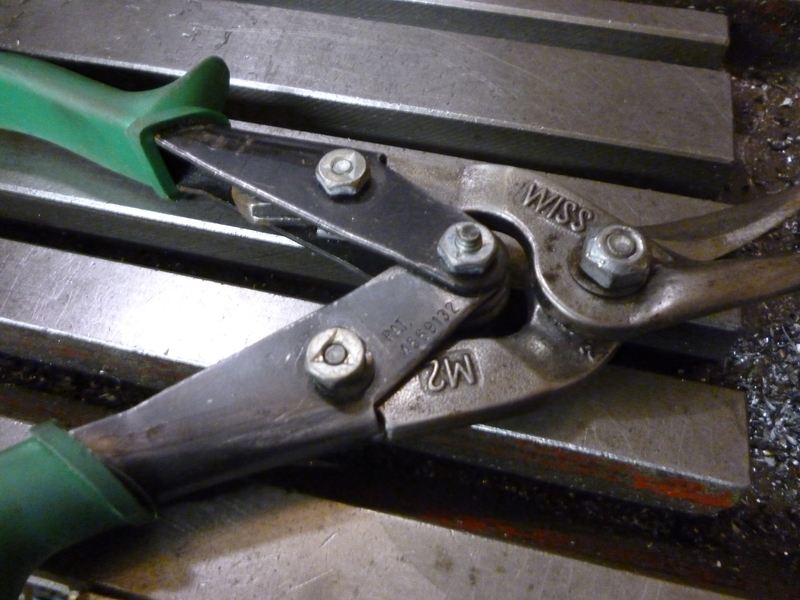 These shears can be usefully used as described elsewhere as of a two part process. The sheet is cut using, say, a jigsaw. This will leave the edges flat but not tidy. 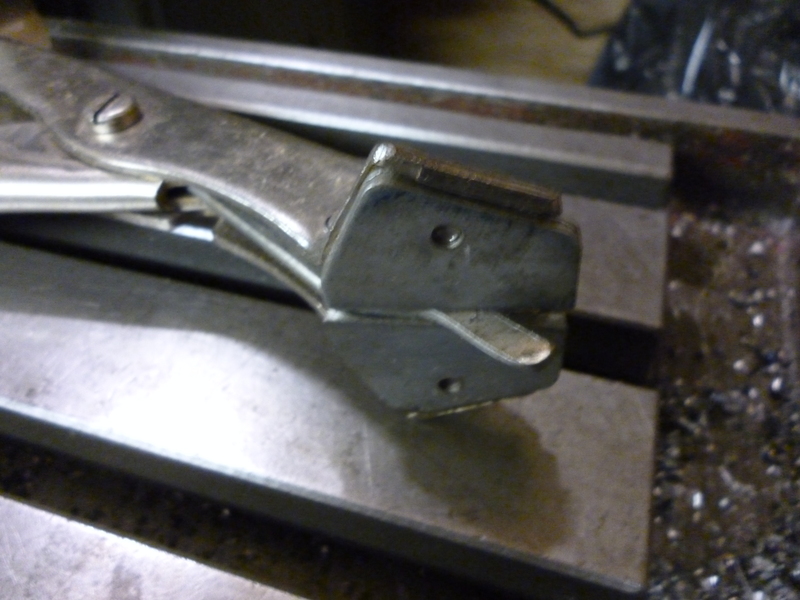 The edge on the part required can then be cleaned up using this sort of shears. Where shears cut flat on one side they can cut round edges but only either left handed or right handed. The result is that shears like this are sold as being left handed or right handed cutting, This is nothing to do with which hand the user is using to hold the shears. From this point both shears are identical – either can be used in either hand. The left handed shear is usually coloured red and the right handed one is green. These often come in sets that includes a third which cuts straight and is yellow. They are sold as being offset compound shears. The best known make are those made by Wiss in the USA. 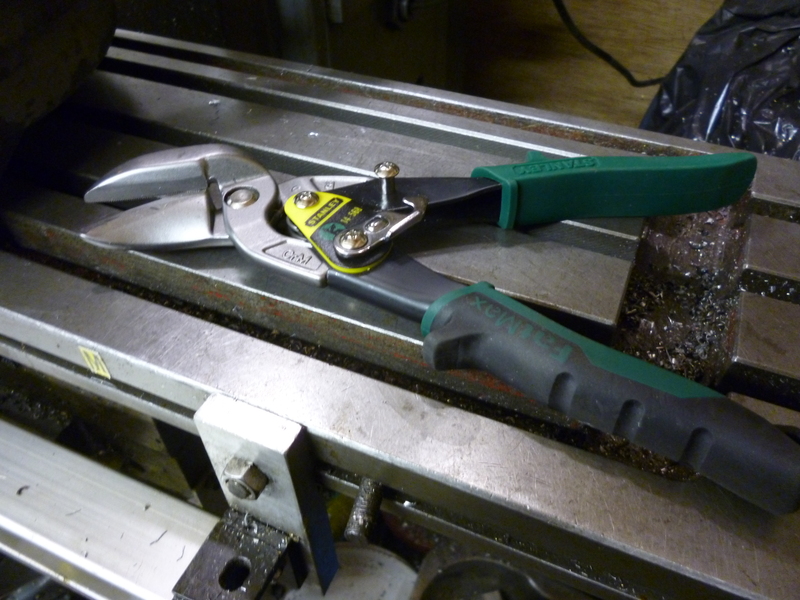 There are very similar shears made by Stanley at significantly lower prices. Given a large flat sheet it should be clear that it is possible to cut it into two parts with one left handed cutter and one right handed cutter cutting at the same time. If, say they are, a few inches apart then the waste is the material in between the two shears. The material on the outside of both shears remains flat. There are cutters made using this technique. The cutter has a single blade that may only be a couple of millimeters wide. The waste is a curl of material the widths of the blade. The length the above makes in one snip is quite small and moving it forwards is not easy but it can work. It is also possible to get cutters that use this principle but are electrically powered or powered by compressed air. With all of these the waste is a long curl. The device only cut along two sides. These are a variation on the above. They are different in that in cutting they chop the waste up so there is no long curl but a lot of rectangular chips.